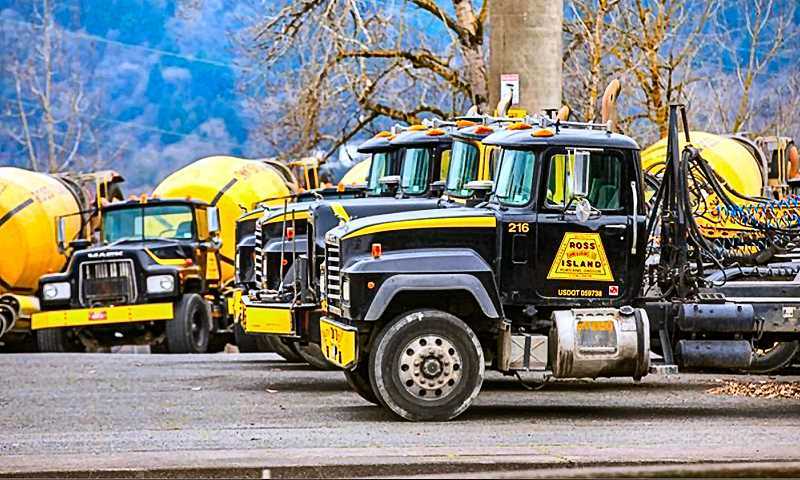 The Ross Island Sand & Gravel Company announced to its workers on Tuesday, January 15, that it was closing its ready-mix concrete division, and laying off around thirty personnel – including laborers, operators, and drivers of the familiar bright-yellow cement mixer trucks. Randall Steed, President and Chief Operating Officer of Ross Island Sand & Gravel, said the following day that closing the division was a long-term business decision – made to focus on the company's contract dredging operation. That side of the business works the length of the western seaboard, and has jobs in California, as well as locally along the Columbia River. In addition to dredging, the company "will also put additional focus on loose aggregate sales – that is, selling sand and gravel to other customers," Steed said. "We'll be selling the assets of the ready-mix concrete division, including the trucks – and, in the long term, the concrete batch plants we operate." The closure will not affect other operations at Ross Island itself, which – like Pamplin Media's Portland Tribune and Community Newspapers, Inc., which includes THE BEE – is owned by the R.B. Pamplin Corporation. Ross Island Sand & Gravel operates locations just north of the Ross Island Bridge, under the Fremont Bridge, and on North Marine Drive, all of which will be closing. However, the administrative headquarters just north of Holgate Boulevard at 4315 S.E. McLoughlin, will remain open. According to the company, many workers from the ready-mix concrete division will be absorbed into the dredging and aggregate production businesses.